Google the person or firm you are researching. Narrow your results when there are too many. Sorting can make the tables easier to manipulate. 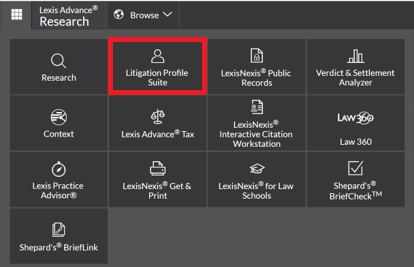 After you login to Lexis Advance, click on the upper left-hand corner (looks like a window). to the left of the "Download Full Report" box. Then, click on the box to the right that has three vertical dots. TURN OFF YOUR POPUP BLOCKER. Example to search: Samuel P. King, former federal judge for the District of Hawaii. 1. Select Judge from the left-hand side drop-down menu. 2. Enter King, Samuel. Names are LAST NAME, FIRST NAME, then select from the drop-down list. You can see by the breakdown of Judge King's ruling history and graphs and charts to help you visualize the data.